This bedroom by Lulu & Georgia has nostalgia written all over it, and that's exactly why it's so cool. A color palette of earthy green, warm coral, and dusty navy comes together for a retro vibe, which is further enhanced by the '70s-inspired gold frame around the sole artwork and the furry accent pillow a few inches below. And check out those sconces, right? Those provide style and function in a throwback package that still appeals to today's design penchant for clean lines. If you're aiming for a vintage look but want to retain a sense of modernity, then color blocking is a great way to achieve it. Choose hues that probably looked just as stellar when Saturday Night Fever was all the rage, and then incorporate them with a modern eye for straightforward dimensions and minimal details. Doing so will wink at an earlier time without making your bedroom feel like a full-blown time travel. 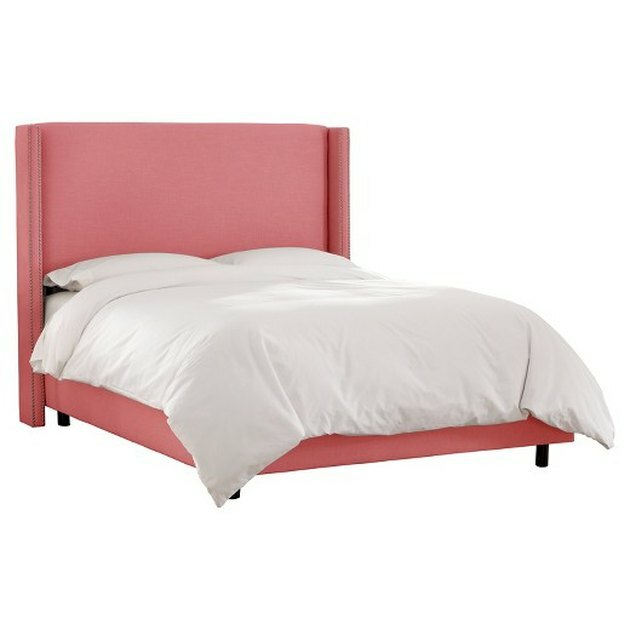 Start your color blocking journey with a coral bed frame.